Novo acionista mostra que questões de interesse dos seus trabalhadores não são prioridade. Lucro, por sua vez, sim! Novamente, em menos de uma semana, a Neoenergia/ Iberdrola desmarcou a reunião com a Intersindical. Dessa vez, não deu tempo nem dos dirigentes sindicais cancelarem as passagens, gerando perda de tempo e despesas desnecessárias para as entidades. O encontro previa o início dos debates sobre a PLR 2018. No último dia 17, a holding já havia desmarcado o encontro, reagendando para o dia 24 e, às vésperas, cancelou novamente, numa demonstração de total desrespeito com o sindicato e, consequentemente, com todos os trabalhadores. Os dirigentes da Intersindical, José Fernandes e Pedro Damásio, do Sintern, Paulo de Tarso, e o conselheiro eleito Dailton Pedreira, do Sinergia, além dos companheiros Pompeu Henrique, Josenildo Rodrigues e Linaldo Leite, do Sindurb, repudiam este descaso e avisam que não vão tolerar qualquer imposição de mudança para a PLR, já que a Neoenergia havia assumido o compromisso de discutir previamente a PLR 2018, na qual os trabalhadores têm interesse de sugerir alterações que visam melhorar o pagamento. Contudo, diante desse descaso, não será admitido qualquer proposta de mudança nas regras com o jogo iniciado, sobretudo que resultem em prejuízos para a categoria. “A Neoenergia tentou realizar modificações no ano passado com o processo da PLR já avançado. Isso não dava oportunidade de realizar os devidos ajustes que evitassem perdas. Para esse ano, a Neoenergia se esquiva do debate antecipado e não pode exigir que novas regras sejam implementadas sem o devido debate”, alertou o coordenador da Intersindical, José Fernandes. 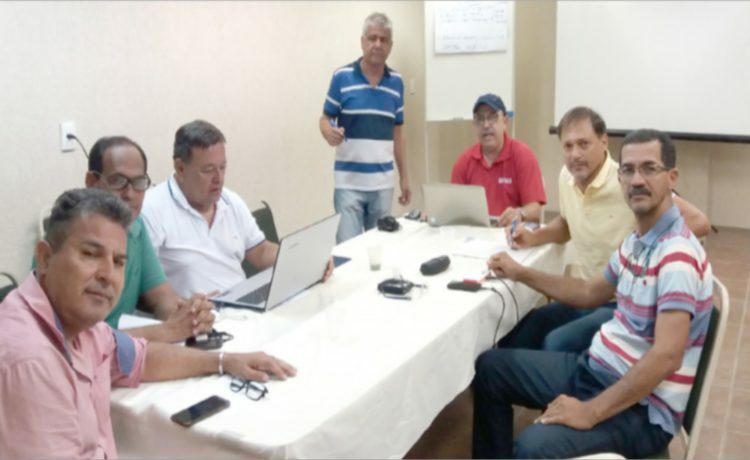 Organização da luta – Aproveitando a oportunidade, os dirigentes da Intersindical se reuniram para organizar as demandas dos trabalhadores do grupo. A reunião que inicialmente seria de alinhamento para o encontro com a Neoenergia serviu para aprofundar as discussões relativas às ações que os dirigentes sindicais vão realizar. A pauta discutiu os seguintes temas: 1) Avaliação do comportamento dos novos acionistas (Demissões); 2) PLR 2018; 3) Campanha Salarial 2018 e 4) Encaminhamentos. I needed to post you the very little remark in order to thank you over again over the incredible concepts you have featured at this time. It is generous with you to give extensively what exactly many individuals could possibly have supplied for an e-book to generate some money for themselves, primarily considering the fact that you could have tried it if you decided. Those good ideas additionally acted like a great way to know that some people have similar desire similar to my personal own to see much more around this condition. I’m sure there are several more pleasant moments ahead for those who looked at your website. I simply wanted to jot down a quick message in order to express gratitude to you for the precious concepts you are sharing here. My time-consuming internet search has at the end of the day been honored with high-quality concept to go over with my family members. I would declare that most of us visitors are definitely lucky to dwell in a fine website with so many perfect individuals with very helpful strategies. I feel really fortunate to have encountered the website page and look forward to tons of more thrilling moments reading here. Thank you once more for all the details. I actually wanted to post a quick comment to be able to say thanks to you for the lovely pointers you are giving out at this site. My prolonged internet research has finally been compensated with wonderful concept to exchange with my guests. I would believe that many of us website visitors actually are unequivocally fortunate to exist in a wonderful place with so many marvellous individuals with very beneficial guidelines. I feel extremely happy to have encountered the site and look forward to tons of more excellent minutes reading here. Thank you again for everything. I wanted to make a note to express gratitude to you for all of the amazing recommendations you are writing at this website. My time intensive internet research has now been honored with reputable know-how to share with my companions. I would express that most of us visitors are undoubtedly blessed to live in a wonderful place with many wonderful people with very helpful basics. I feel truly blessed to have come across your entire web page and look forward to plenty of more brilliant minutes reading here. Thank you again for all the details. I enjoy you because of all of your effort on this site. Betty really loves setting aside time for research and it’s really simple to grasp why. Almost all learn all relating to the dynamic form you make both interesting and useful guidance through this web blog and even welcome participation from other ones on the subject matter plus our girl is understanding a whole lot. Have fun with the rest of the year. You have been carrying out a really great job. I needed to send you the tiny word just to give many thanks as before on your exceptional methods you’ve provided in this case. It is really incredibly open-handed with people like you to deliver unhampered exactly what most people could possibly have offered for sale for an ebook to get some dough on their own, specifically since you might well have done it if you considered necessary. The tactics also worked as the good way to fully grasp other people online have similar interest just as mine to understand good deal more in regard to this matter. I’m certain there are a lot more fun periods ahead for individuals who scan your website. I as well as my friends happened to be looking at the great advice found on your web page and then unexpectedly got a terrible feeling I never expressed respect to the blog owner for those techniques. Most of the boys are already certainly stimulated to read them and already have actually been making the most of those things. Thank you for indeed being indeed accommodating and then for utilizing certain outstanding guides millions of individuals are really wanting to be informed on. My personal sincere regret for not saying thanks to sooner. Thanks a lot for providing individuals with a very memorable opportunity to read in detail from this web site. It really is very nice plus full of fun for me and my office co-workers to visit the blog particularly 3 times in one week to learn the latest guidance you will have. And lastly, I’m also always motivated for the terrific tips served by you. Certain 2 ideas in this post are undeniably the very best we’ve ever had. I needed to create you one bit of remark just to say thank you again on your pleasant tips you have contributed above. It has been so extremely generous of people like you to offer freely what exactly many people could possibly have sold as an ebook to help with making some bucks on their own, and in particular since you could have tried it if you ever decided. The creative ideas in addition acted as the great way to be aware that some people have a similar zeal like mine to know the truth a good deal more when it comes to this matter. I’m sure there are many more pleasant occasions up front for people who view your blog post. I really wanted to write a brief note to be able to say thanks to you for those marvelous steps you are showing on this website. My time consuming internet search has finally been paid with sensible insight to talk about with my classmates and friends. I would express that most of us website visitors actually are quite blessed to dwell in a remarkable place with so many perfect people with helpful secrets. I feel very much privileged to have seen your entire website and look forward to many more entertaining minutes reading here. Thanks again for all the details. I simply wanted to write a note in order to express gratitude to you for all the stunning solutions you are sharing at this site. My time-consuming internet investigation has at the end been honored with really good insight to talk about with my pals. I ‘d mention that most of us website visitors are really blessed to exist in a wonderful network with so many awesome individuals with interesting tips and hints. I feel extremely happy to have discovered your entire web page and look forward to some more brilliant moments reading here. Thanks once again for a lot of things. I precisely needed to say thanks again. I’m not certain the things I would’ve implemented without these recommendations documented by you relating to my theme. It has been an absolute scary setting for me, nevertheless seeing this well-written fashion you handled that forced me to jump over fulfillment. Extremely thankful for this work and then hope that you find out what an amazing job you’re providing instructing the mediocre ones via your web blog. I am sure you’ve never encountered all of us. jltmipjvjd,Thanks for ones marvelous posting! I actually enjoyed reading it, you will be a great author.I will always bookmark your blog and will onzzbodqrh,come back from now on. I want to encourage that you continue your great writing, have a nice afternoon! I intended to send you the very little word just to give many thanks yet again about the beautiful suggestions you’ve discussed on this page. It was certainly extremely open-handed with people like you to convey easily precisely what a lot of people could have distributed as an e book in order to make some money for their own end, notably seeing that you could have tried it in the event you decided. Those techniques also acted to be a easy way to realize that other people have a similar fervor similar to my personal own to grasp whole lot more on the topic of this matter. I am certain there are many more fun sessions up front for individuals who look over your blog. My wife and i have been excited that Louis managed to do his preliminary research with the precious recommendations he grabbed through your weblog. It is now and again perplexing to simply happen to be giving for free tips which usually other folks have been selling. So we do know we have got you to appreciate because of that. The most important explanations you have made, the simple website menu, the relationships your site make it easier to create – it’s got most superb, and it is assisting our son in addition to the family know that that matter is interesting, and that’s extraordinarily serious. Thank you for all the pieces! fhvocj,Hi there, just wanted to say, I liked this article. It was helpful. Keep on posting! I wish to convey my passion for your generosity giving support to individuals that should have guidance on this important idea. Your personal dedication to getting the solution all over had become incredibly good and has always enabled somebody just like me to reach their pursuits. This helpful advice means a lot to me and extremely more to my peers. Many thanks; from each one of us. I precisely wanted to appreciate you again. I am not sure the things that I might have followed in the absence of these suggestions discussed by you over such field. Entirely was the challenging setting for me, nevertheless coming across a specialised approach you solved that took me to cry over joy. I am grateful for this service and have high hopes you are aware of a powerful job you have been putting in teaching others by way of a blog. I am certain you’ve never met any of us. aokobu,Some really nice stuff on this website, I enjoy it. I’m also commenting to make you know what a perfect encounter my daughter encountered reading through the blog. She came to find a lot of issues, with the inclusion of what it is like to have a marvelous coaching character to let many others very easily completely grasp some tricky matters. You actually surpassed her expectations. Many thanks for providing those priceless, trustworthy, educational and in addition unique tips about this topic to Tanya. Thank you a lot for giving everyone an exceptionally memorable possiblity to read in detail from this blog. It can be so great and as well , full of amusement for me personally and my office acquaintances to search your site particularly three times weekly to find out the new issues you will have. And of course, I’m also always impressed concerning the remarkable knowledge you give. Selected 4 tips in this post are rather the very best we have had. I must convey my gratitude for your kindness in support of folks that should have help with this one content. Your very own commitment to passing the message up and down has been remarkably invaluable and have always empowered employees like me to realize their ambitions. Your amazing insightful hints and tips means much a person like me and even further to my mates. Best wishes; from each one of us. Thank you a lot for providing individuals with an exceptionally special chance to read from this blog. It is always very excellent plus packed with a lot of fun for me personally and my office peers to visit your blog at a minimum three times weekly to study the latest things you have. Of course, I’m also at all times motivated for the striking information you give. Selected two facts in this posting are certainly the finest we’ve ever had. I together with my buddies have been examining the great tips and tricks located on your web site then all of a sudden got an awful suspicion I had not thanked the site owner for those techniques. Those ladies ended up for that reason happy to read through all of them and already have truly been loving those things. We appreciate you truly being considerably kind and for having this kind of tremendous information most people are really desirous to understand about. My personal honest regret for not expressing gratitude to earlier. My wife and i were so relieved when Raymond could complete his survey because of the precious recommendations he came across from your very own weblog. It’s not at all simplistic to just always be giving out ideas the rest might have been selling. And we also grasp we need the website owner to thank for that. The specific illustrations you made, the straightforward site navigation, the friendships your site make it easier to promote – it’s mostly remarkable, and it’s making our son in addition to us reason why the theme is enjoyable, and that’s tremendously important. Thanks for all! I want to convey my affection for your generosity supporting people who really want help with in this niche. Your special dedication to getting the message around turned out to be amazingly useful and has really helped some individuals much like me to realize their endeavors. Your amazing important publication signifies a lot a person like me and a whole lot more to my office workers. Warm regards; from all of us. kwahjifcifm,If you are going for best contents like I do, just go to see this web page daily because it offers quality contents, thanks! vydwwkrqozj,A fascinating discussion is definitely worth comment. I do think that you ought to publish more on this topic, it may not be a taboo lkutvyl,subject but generally folks don’t talk about such subjects. To the next! All the best! !